When: Thursday, September 19, 2013 @ 8:30 a.m. – 12:00 p.m.
· Why was the limestone of the Oakes Quarry mined? · There are cracks in the quarry floor... How does this relate to the building of the ancestral Appalachian Mountains? · What sea level changes occurred as the limestone beds of the Brassfield Formation were being deposited? · What evidence supports that a tropical sea covered Ohio some 435 million years ago? 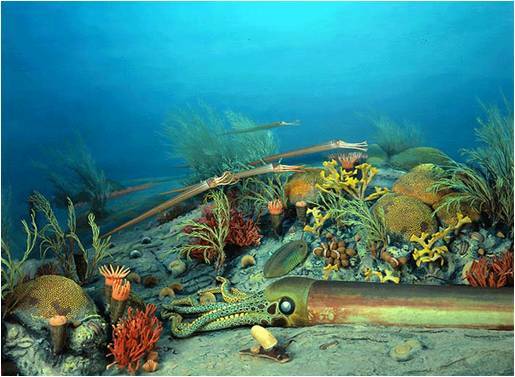 · What do the types of fossils tell us about the climate during the Silurian Period? · Why are there no rocks in the Oakes Quarry that contain coal, dinosaur fossils, or giant fossil sharks? · What evidence supports that glaciers moved across the Oakes Quarry many thousands of years ago? · In what direction did the ice flow and what did the glaciers leave behind? After the rain stopped around 11:00 AM, the group drove back to the Oakes Quarry to walk and examine the unique geological concepts and features in person. The group was given a chance to collect fossils and hike to the top of the quarry high wall to examine the glacial striations and grooves present. It turned out to be a GREAT Day to walk in the Quarry! Several of the participants met later at a local restaurant in Fairborn for additional discussions and fellowship. Kudos go to Lori Parratt from Wood County, who got up at 5:30 AM for the three hour drive down from Bowling Green. Lori was able to take home some interesting specimens of Silurian marine fossils (corals, crinoid stems, and crinoid bases) from the quarry. For more information regarding quarry and fossil photos...... see attached links and publications.